Come and experience an unforgettable night under the stars at Brockholes! 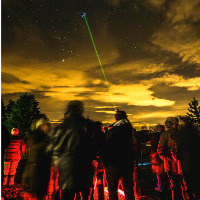 Come and experience an unforgettable night under the Moonlight and stars at Brockholes! Local Astronomer Robert Ince will be your guide taking you on an incredible journey through the constellations and along the Milky Way, while also showing you how to find all sorts of heavenly objects for yourself. We will try and show some of the skies wonders including our own satellite - the Moon - through our powerful telescopes and binoculars. These are all operated by local astronomers, who will attempt to answer your questions on life, the universe and everything! Wrap up warm - winter nights can be cold, bring binoculars if you have them and also a torch. This event is only suitable for children aged 8+ who are able to sit and listen to a speaker. The ticket price includes free parking and hot drinks and biscuits. Be quick as this is always a popular event! Come dressed for the weather wearing warm clothing and sturdy footwear.